Join the Wine&Spirit Lodging Loyalty Program! Every night you spend at one of our Wine&Spirit Lodging private estate, grapes can be redeemed. The enrollment to our membership program is 29,90€*. 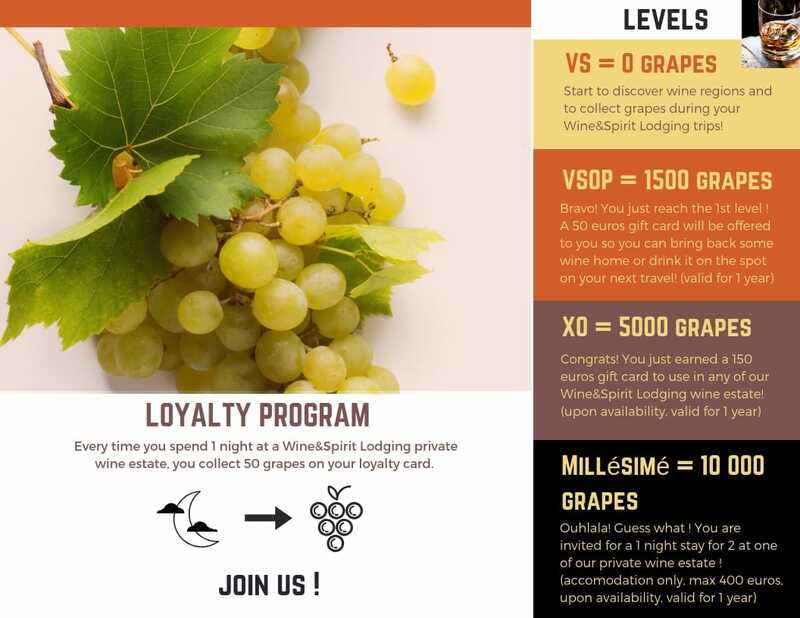 In exchange you will receive your membership card at home and you will be able to gain grapes at every stay in a Wine&Spirit Lodging estate. You will also receive 2 personalized newsletter during the year based on your interests (sport, culture, wine...). Fill in the form here and join our membership program! From your enrollment, when you spend a night at one of our private wine estate, show your membership card (or give your email if you haven't received it yet) and Wine&Spirit Lodging will credit you 50 grapes per night spent on your account. If you showed your membership card to the estate and can't see your extra grapes after 1 month, send us an email and we will help you getting them! Simply log-on here to admire your grapes! How many did you collect yet? * price including sending fees in European Union countries only. Possible added cost for other destinations.